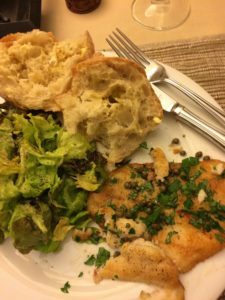 Immersing myself in Sole Meunière a la Julia Child this last week or so has entailed adding new cookbooks to my collection, studying her recipes, tips and watching the movie, Julie and Julia, again. That movie speaks to my soul (okay, this time, no pun intended). I always cry when I watch it. I’m not a crier. In the scene when Julie comes home from her day job of trying to help people who lost loved ones in 9-11 fill out government forms, she talks about how cooking helps her cope with all the things she has no control over. Like Julie in the film, and I would guess, like Julia Child, herself, cooking is therapeutic for me. I can take ingredients and make something wonderful, getting results I can share in less than an hour. That is not the case in my day job where we can work for years, say, to pass a policy that is meant to protect endangered salmon and steelhead from multiple types of pesticides that mess with their ability to smell, find food, and avoid predators. Working to protect the health of people and the environment takes a lot of time, has many ups and downs, and involves lots of things I have no control over. But cooking, ahhhh – the change you create when taking butter and fresh fish, some parsley and lemon – that change happens quickly and you immediately have something to show for your effort. 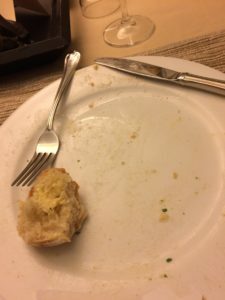 It brings so much satisfaction when you sit down with your guests, toast to health, and dig your fork into something delicious. Honestly, its an important creative outlet that helps keep me going in the face of fighting the good non-profit health and environment fight! Some people do yoga. I cook. Well, sometimes I do yoga, too. 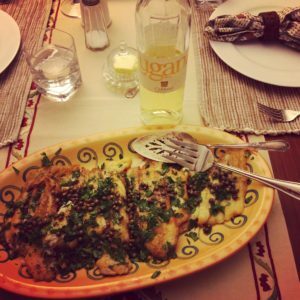 -Use clarified butter or ghee to sauté the fillets, Julia recommends a mixture of vegetable oil and clarified butter. 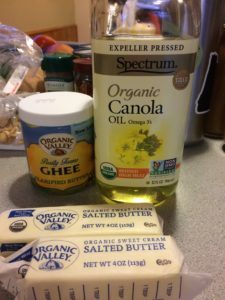 You can make your own clarified butter or purchase organic ghee (organic valley makes it and sells it in the egg/butter case). 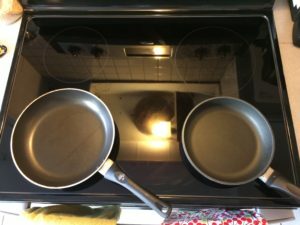 Note: You want to film each pan with oil/ghee mix and clean the pan out between batches; keep these ingredients handy so you can refresh the oil and ghee with each new batch of fillets. Heat oven to 200 degrees for keeping fish warm as you sauté. Prep all ingredients. 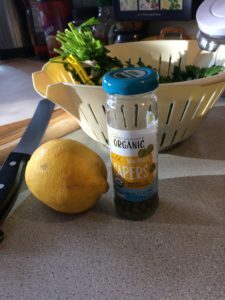 Rinse parsley and lemon. 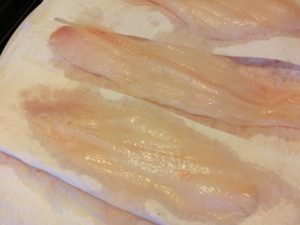 Pat fish dry and store on paper towels in fridge until ready to cook. Remove stems and roughly chop leaves of parsley. Cut lemon in half. Slice one half for garnish. Juice the other half of lemon. Put flour in wide, flat bowl or on plate for dredging. temperature so you don’t burn the butter and fish. Before sautéing, season all sides of fish with salt and pepper. Heat ghee and oil on medium high (adjust heat down if too hot for type of pan) until butter foams and then foam begins to subside. As pans heat, prepare to dredge fillets in flour right before adding them to the pan. 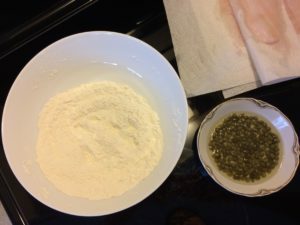 Dredge fillets and shake off excess flour. Add to hot pan making sure there is room between fillets. If fish is too close together it will steam instead of sauté. Sauté until fish is springy, not squashy. Fish should take on a light springiness to the touch. Don’t overcook. If fish flakes it is overdone. I sautéed the fillets about 2 minutes on each side to where they were golden brown but still springy. Keep cooked fillets warming in a large baking dish in the oven as you finish the batches. Between each batch, wipe plan clean with paper towels so the flour doesn’t leave residue and burn. Cook fish in batches, renewing oil and ghee as you go. Put fish on a serving platter and top with chopped parsley. Set aside, but not too long. You don’t want to lose the heat on the fish. Quickly wipe one of the pans clean. Set over medium-high heat; adjust heat as needed so as not to burn the butter. Add fresh butter (not ghee). Heat until bubbling (and just a shade under nut brown). This last bit is important because as soon as you add the capers and lemon it darkens fast. You might even add the capers and lemon while sliding the pan off the burner and back on to bring the butter to the desired hazelnut brown color. After you add the lemon juice and capers, stir and then immediately pour the butter sauce over the parsley topped fillets on your platter. 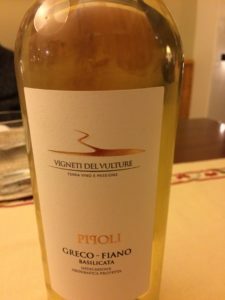 The second bottle was: Vigneti Del Vulture; Terra Vino E Passione; Pipoli; Greco-Fiano; Basilicata, Indicazione Geografica Protetta; 60% Greco and 40% Fiano; 2013; $15/bottle. 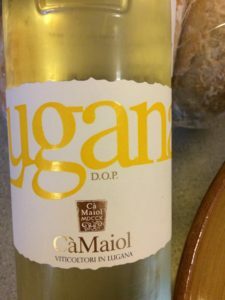 Tasting notes: dry with tropical and citrus notes of mango, papaya, lime, grapefruit and ginger; with slight hints of licorice, chocolate and strawberry. We didn’t like it at all! Child, Julia. The Way to Cook. Alfred A. Knopf 1989, page 139. Child, Julia and Jacques Pepin. Julia and Jacques Cooking at Home. Alfred A. Knopf 2000, pp. 244-245.